I’m going to be traveling with Ms. O’cosm and family to Alaska in July, and whenever I travel I like to read up on the history, mythology, and religious traditions associated with my destination. We’ll be sailing aboard a 63,000 ton cruise ship with ports of call along the Inside Passage, which has historically been home to a number of Native American tribes, particularly the Tlingit. The Tlingit have a fascinating culture, and I’m thrilled that I’ll be able to visit with some craftsmen and cultural representatives in the town of Ketchikan. 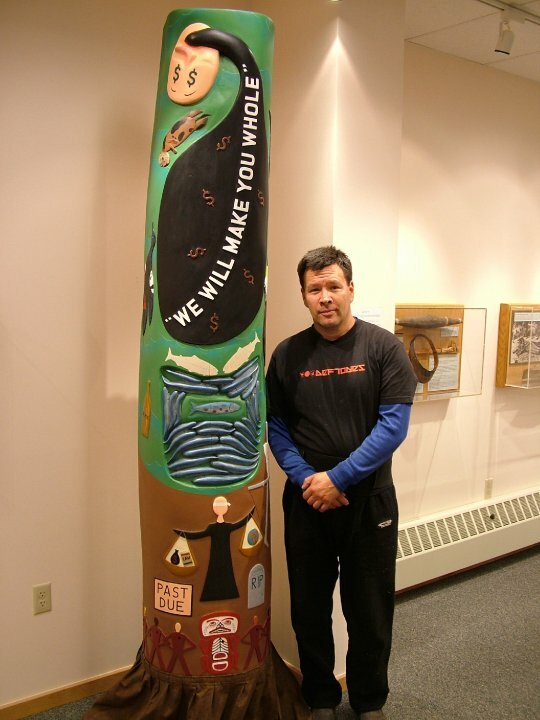 A ubiquitous artifact of the native culture of the Pacific Northwest is the totem pole. To the right you can see a very old red cedar memorial pole (pts-aan), dating to circa 1870, which now resides in the British Museum. Each figure on the pole represents a crest of the family or tribe. A crest is an animal or similar symbol which stands for a cultural artifact of some kind – a person, a story, a historical episode, what have you. 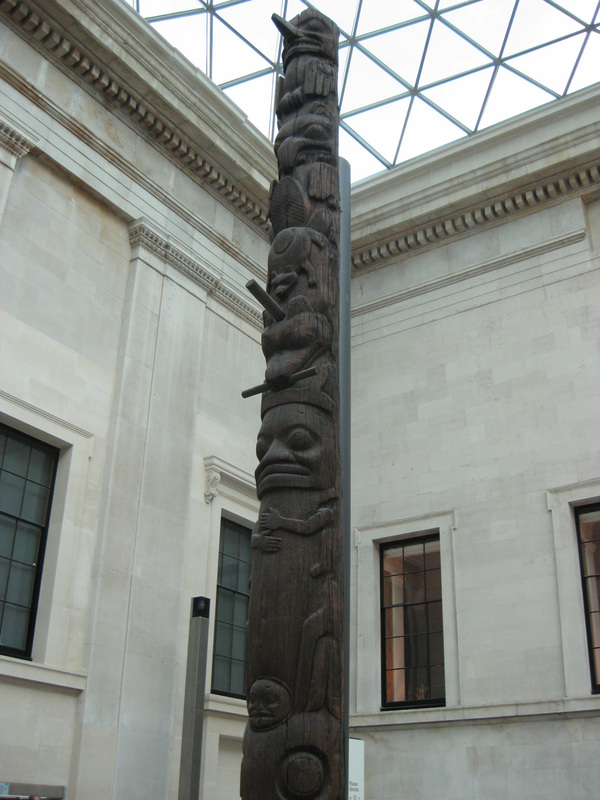 A Tlingit pole, then, can present a collection of stories, events, and mythological episodes associated with a specific family or group. This particular pole was erected in memory of Chief Luuya’as and depicts crests from the Eagle-Beaver clan. I was surprised to learn that the poles are sometimes used to mock or ridicule persons, who may be depicted in animal caricatures or upside-down. These shame pole, which usually depicts people who have refused to honor an obligation or debt, are displayed in public spaces. I learn from this Wikipedia article, for example, that the Three Frogs shame pole of Wrangell, Alaska, depicts three deadbeat dads who refused to pay support for their illegitimate children. The pole tells the grim story of the spill: sea ducks, a sea otter and eagle float dead on oil. A sick herring with lesions is featured. There’s a boat for sale with a family crew on board, commemorating fishermen who went belly up, and a bottle of booze to remind people that Joe Hazelwood, who was captain of the Exxon Valdez, had been drinking before turning the helm of the ship over. Topping the pole is the upside-down face of former longtime Exxon CEO Lee Raymond, sporting a Pinocchio-like nose. There are some wonderful resources on the web concerning the Tlingit, and other peoples in the region. The first I’d like to call attention to is the Internet Archive of Sacred Texts, which hosts an online copy of John R. Swanton’s Tlingit Myths and Texts, a superb collection of myths and legends from 1909. I’ve been focusing on the enigmatic and complex trickster figure of the Raven in my reading. As Lewis Hyde copiously demonstrates in his fascinating study Trickster Makes This World, the trickster figure is associated with creation and demarcation in many cultures around the world, and this is certainly true of the Tlingit Raven. Numerous etiological legends associated with the Raven explain the origins of all sorts of natural phenomena. This archetype of the creative trickster is something I will return to in a later post. Another terrific resource is the American Indians of the Northwest Collection, hosted by the University of Washington. This site features excellent essays and photographs from their archives. I’ve now published a much more extensive look at totem poles and the cultures of the Pacific Northwest here.